Do Atari Systems Need USB? AEX: Tangerine Dream Machine Version 2! In the early eighties, at the height of the arcade video game craze, everybody with a bit of technical knowledge wanted to make video games and cash-in on the action. Every arcade video game company in the world was trying every type of gimmick imaginable to come up with the next Pac-Man or Asteroids. When they weren't able to, they sometimes decided to try other ideas to appeal to both players and operators. Putting proven home console or computer games in arcade cabinets and making it easy to change the cabinet into a new game was one of those ideas. Several companies tried it. Nintendo was the only one which had any success with its UniSystem and PlayChoice-10 systems. The idea never really took off and the other attempts at home hardware-based arcade systems from companies such as American LaserGames, fell into obscurity. Atari never saw it as a good enough idea to try it directly, although a spin-off company, Sente, developed the SAC-3, based on Amiga hardware, but never released it. Atari did, however, give license to another company, Exidy, to release an arcade system with an Atari computer inside - an Atari 600XL to be exact. Exidy contracted First Star Software to develop cartridge based versions of four of their games to be used for the system. The titles were Boulder Dash, Bristles, Flip and Flop and Astro Chase. They called the system Max-A-Flex. The four games were only released in their cartridge form for this system and are therefore quite rare and collectible by Atari home system collectors. They will play just fine on an Atari 800 compatible computer. Most collectors don't know the reason they are so rare. Exidy designed the Max-A-Flex system by removing the keyboard from the 600XL, mounting it to the side of the cabinet with its original power supply, installing a composite video to RGB converter (to use a regular arcade monitor) and creating a custom controller/timer/audio amp circuit board that plugged into the keyboard interface connector. This was wired to arcade controls and the coin door. When a quarter is inserted into a slot, an amount of time determined by dip switch settings on the controller board is added. While the timer is running, all controls are active and you can control the game via Start, Select, Option, an 8-way joystick and one button. When the timer gets down to 10 seconds of play remaining, the control board starts beeping a progressively higher pitched beep and flashing the "insert coin" and "extend play" lights. When the timer gets to zero, the controls become non-functional, but the game does not reset, so you could add more coins and continue playing. 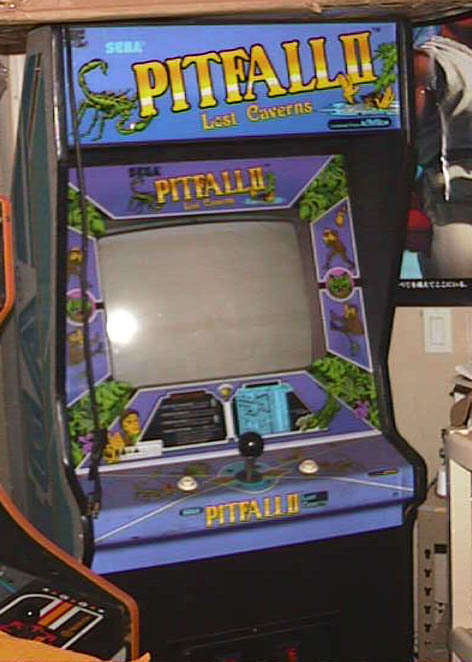 Exidy used a pre-made cabinet used by several arcade game companies, such as Sega, for Pitfall 2 (a remake of Pitfall, not a console-in-a-cabinet), seen at http://www.arcadecollecting.com/pitfall2/pitfall2.jpg. Generic arcade-theme artwork was created by their art department for the cabinet and game-specific marquees were made for each of the four titles. The system was a huge flop. The idea was decent, but only Boulder Dash was even mildly popular and the other games weren't big sellers even on the original home systems. Exidy didn't have a huge library of titles it could crank out for the system and so couldn't use sheer numbers of titles alone as a selling point like Nintendo did. Hardly any cabinets were put into circulation and barely anybody knows it even existed. Boulder Dash is one of my favorite games and I always found the two other arcade ports of it to be lacking. I had heard of Exidy's system from some of the hard-core arcade game collectors, but had never seen one, but kept my eyes out. Finally, the Boulder Dash I was looking for showed up on eBay in late July '02. Apparently not many other people had heard of or cared about it either. The bidding didn't go crazy and I was able to pick up the cabinet for about the going market rate for any of the non-classic games you see selling on eBay. More pictures and the story of how I acquired my Max-A-Flex cabinet can be found on my web site, http://www.arcadecollecting.com, hidden under the "Games in my collection -> Boulder Dash" link.